Mark Bilderback likes to tell stories. And if you've come into contact with him over the past 20 years, you've likely heard one story in particular. One day he and his son, who was 5 years old at the time, came across a small car fire. Mark sees the situation as a learning opportunity for his son. "I'm thinking, 'Here's a chance to show him that I know how to put this fire out,'" he says. "So I stop our car and tell him in my best Super Dad voice, 'Son, stay here.'" Mark exits his car, hurries to the trunk, grabs his fire extinguisher, and approaches the other car. "I make sure I turn sideways so my son can see me holding the fire extinguisher," he says. "I then stop at his window and say something to the effect of, 'It's OK, son, I've got this.'" Actually, it turns out Mark didn't have this. "I get over to the other car, pull the pin on the fire extinguisher, aim it at the base of the fire, squeeze the trigger … and all it does is run down my hand," he says. The extinguisher had been in his trunk so long it no longer worked. Colleague Meredie Sexton tells us Mark injects a unique sense of humor and lightheartedness into his work. "No matter how many times you hear his fire jokes, he still manages to get a chuckle out of you," she says. And Emergency Management intern Katherine Mortenson tells us Mark's "attitude and outlook on life" are contagious. "Regardless of what's going on, if you ask him how he's doing, he always says he's 'just about perfect.' He truly cares about the people he works with and he makes every work day an unpredictable adventure," she says. 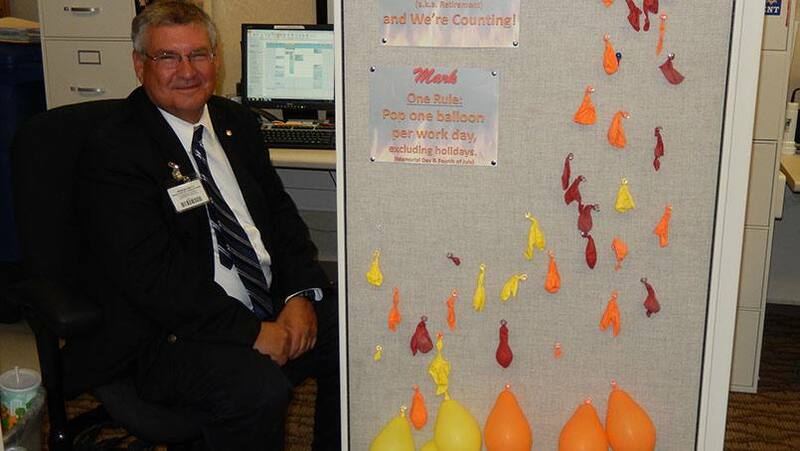 Mark will likely be reigniting some of his fire jokes and stories during his retirement celebration on July 7. "I've really enjoyed my life here in Emergency Management working with fire education and conducting probably 95 percent of all fire drills that happen here at Mayo Clinic," Mark tells us. "A lot of what we do from a safety standpoint carries over into our employees' homes, so we know their families are also a lot safer as a result of our work. That's been the most gratifying part for me." Celebrate with us by sharing your comments below. You can use the handy social media tools atop this page to share this story with others. There is nothing like hearing Mark tell the story with his posturing, dramatic pauses, and wonderful facial expressions! And we all remember the point of the story too.